Over 40 recruitment industry leaders, authors, consultants, Big Billers, Human Resource and Staffing professionals and expert LinkedIn users generously share their secrets of LinkedIn success. The book will show recruiters, sourcers and others in the recruitment industry how they can make more effective use of the various tools and resources within LinkedIn. 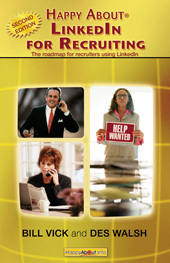 "This book and the use of LinkedIn is truly an innovation in recruiting!"